S3 stores data as objects within buckets. An object consists of a file and optionally any metadata that describes that file. A key is the unique identifier for an object within a bucket. Storage capacity is virtually unlimited. Choose the geographical region where to store the bucket and its contents. Bucket name must be a unique DNS-compliant name. After you create the bucket you cannot change the name. The bucket name is visible in the URL that points to the objects that you’re going to put in your bucket. By default, you can create up to 100 buckets in each of your AWS accounts. You can’t change its Region after creation. You can host static websites by configuring your bucket for website hosting. S3 STANDARD for general-purpose storage of frequently accessed data. S3 REDUCED_REDUNDANCY (RRS) for noncritical, reproducible data that can be stored with less redundancy than the STANDARD storage class. Not recommended because STANDARD storage class is more cost effective. S3 STANDARD_IA for long-lived, but less frequently accessed data. It stores the object data redundantly across multiple geographically separated AZs. S3 ONEZONE_IA stores the object data in only one AZ. Less expensive than STANDARD_IA, but data is not resilient to the physical loss of the AZ. These two storage classes are suitable for objects larger than 128 KB that you plan to store for at least 30 days. If an object is less than 128 KB, Amazon S3 charges you for 128 KB. If you delete an object before the 30-day minimum, you are charged for 30 days. Archived objects are not available for real-time access. You must first restore the objects before you can access them. You cannot specify GLACIER as the storage class at the time that you create an object. Glacier objects are visible through S3 only. Expedited – allows you to quickly access your data when occasional urgent requests for a subset of archives are required. For all but the largest archived objects, data accessed are typically made available within 1–5 minutes. There are two types of Expedited retrievals: On-Demand requests are similar to EC2 On-Demand instances and are available most of the time. Provisioned requests are guaranteed to be available when you need them. Standard – allows you to access any of your archived objects within several hours. Standard retrievals typically complete within 3–5 hours. This is the default option for retrieval requests that do not specify the retrieval option. Bulk – Glacier’s lowest-cost retrieval option, enabling you to retrieve large amounts, even petabytes, of data inexpensively in a day. Bulk retrievals typically complete within 5–12 hours. For S3 Standard, S3 Standard-IA, and Glacier storage classes, your objects are automatically stored across multiple devices spanning a minimum of three Availability Zones. REST – use standard HTTP requests to create, fetch, and delete buckets and objects. You can use S3 virtual hosting to address a bucket in a REST API call by using the HTTP Host header. Specify the AWS Region where you want S3 to create the bucket. All your resources are private by default. 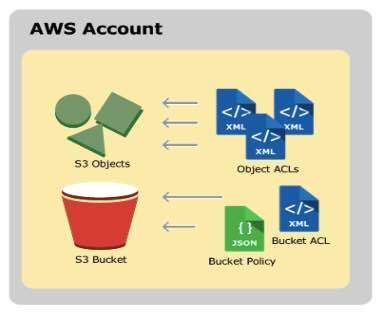 Use bucket policy and ACL options to grant and manage bucket-level permissions. You can configure your bucket to allow cross-origin requests. CORS defines a way for client web applications that are loaded in one domain to interact with resources in a different domain. You can configure your bucket for static website hosting. Logging enables you to track requests for access to your bucket. Each access log record provides details about a single access request, such as the requester, bucket name, request time, request action, response status, and error code, if any. AWS recommends VERSIONING AS A BEST PRACTICE to recover objects from being deleted or overwritten by mistake. You can define lifecycle rules for objects in your bucket that have a well-defined lifecycle. Cross-region replication is the automatic, asynchronous copying of objects across buckets in different AWS Regions. S3 provides the tagging subresource to store and manage tags on a bucket. AWS generates a cost allocation report with usage and costs aggregated by your tags. By default, the AWS account that creates the bucket (the bucket owner) pays for downloads from the bucket. The bucket owner can specify that the person requesting the download will be charged for the download. Transfer Acceleration enables fast, easy, and secure transfers of files over long distances between your client and an S3 bucket. It takes advantage of Amazon CloudFront’s globally distributed edge locations. Are private by default. Grant permissions to other users. Each S3 object has data, a key, and metadata. You cannot modify object metadata after object is uploaded. Can User Modify the Value? Object creation date or the last modified date, whichever is the latest. The base64-encoded 128-bit MD5 digest of the object. Indicates whether server-side encryption is enabled for the object, and whether that encryption is from the AWS Key Management Service (SSE-KMS) or from AWS managed encryption (SSE-S3). Object version. When you enable versioning on a bucket, Amazon S3 assigns a version number to objects added to the bucket. In a bucket that has versioning enabled, this Boolean marker indicates whether the object is a delete marker. Storage class used for storing the object. Redirects requests for the associated object to another object in the same bucket or an external URL. If x-amz-server-side-encryption is present and has the value of aws:kms, this indicates the ID of the AWS Key Management Service (AWS KMS) master encryption key that was used for the object. Indicates whether server-side encryption with customer-provided encryption keys (SSE-C) is enabled. User-defined metadata – key-value pair that you provide. You can upload and copy objects of up to 5 GB in size in a single operation. For objects greater than 5 GB up to 5 TB, you must use the multipart upload API. You can associate up to 10 tags with an object. Tags associated with an object must have unique tag keys. A tag key can be up to 128 Unicode characters in length and tag values can be up to 256 Unicode characters in length. Key and values are case sensitive. 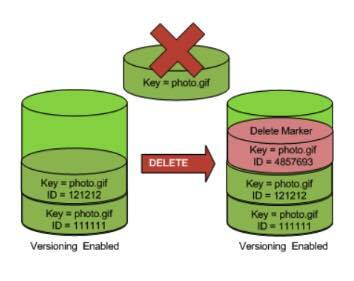 Specify a non-versioned delete request – specify only the object’s key, and not the version ID. Specify a versioned delete request – specify both the key and also a version ID. If you provide an invalid MFA token, the request always fails. If you are not deleting a versioned object, and you don’t provide an MFA token, the delete succeeds. A lifecycle configuration is a set of rules that define actions that is applied to a group of objects. Transition actions—Define when objects transition to another storage class. For S3-IA and S3-One-Zone, the objects must be stored at least 30 days in the current storage class before you can transition them to another class. Expiration actions—Define when objects expire. S3 deletes expired objects on your behalf. No charge for creating a bucket, but only for storing objects in the bucket and for transferring objects in and out of the bucket. You pay for storing objects in your S3 buckets. The rate you’re charged depends on your objects’ size, how long you stored the objects during the month, and the storage class. You pay for requests, for example, GET requests, made against your S3 buckets and objects. This includes lifecycle requests. The rates for requests depend on what kind of request you’re making. You pay for retrieving objects that are stored in STANDARD_IA, ONEZONE_IA, and GLACIER storage. If you delete an object stored in STANDARD_IA, ONEZONE_IA, or GLACIER storage before the minimum storage commitment has passed, you pay an early deletion fee for that object. You pay for the storage management features that are enabled on your account’s buckets. You also pay a fee for any data transferred using Amazon S3 Transfer Acceleration. Amazon S3 routes any virtual hosted–style requests to the US East (N. Virginia) region by default if you use the endpoint s3.amazonaws.com, instead of the region-specific endpoint. In a path-style URL, the endpoint you use must match the Region in which the bucket resides. Customize S3 URLs with CNAMEs – the bucket name must be the same as the CNAME. Amazon S3 Transfer Acceleration enables fast, easy, and secure transfers of files over long distances between your client and an S3 bucket. It takes advantage of Amazon CloudFront’s globally distributed edge locations. Transfer Acceleration cannot be disabled, and can only be suspended. Effect – can be either allow or deny. Need to explicitly grant allow to a resource. Principal – the account, service or user who is allowed access to the actions and resources in the statement. Provides centralized access control to buckets and objects based on a variety of conditions, including S3 operations, requesters, resources, and aspects of the request (e.g., IP address). Can either add or deny permissions across all (or a subset) of objects within a bucket. IAM users need additional permissions from root account to perform bucket operations. Bucket policies are limited to 20 KB in size. A list of grants identifying grantee and permission granted. ACLs use an S3–specific XML schema. You can grant permissions only to other AWS accounts, not to users in your account. You cannot grant conditional permissions, nor explicitly deny permissions. Object ACLs are limited to 100 granted permissions per ACL. The only recommended use case for the bucket ACL is to grant write permissions to the S3 Log Delivery group. Use versioning to keep multiple versions of an object in one bucket. Versioning protects you from the consequences of unintended overwrites and deletions. 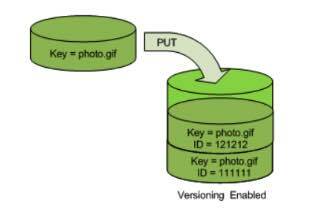 You can also use versioning to archive objects so you have access to previous versions. Since versioning is disabled by default, need to EXPLICITLY enable. When you PUT an object in a versioning-enabled bucket, the non-current version is not overwritten. When you DELETE an object, all versions remain in the bucket and Amazon S3 inserts a delete marker. Performing a simple GET Object request when the current version is a delete marker returns a 404 Not Found error. You can, however, GET a non-current version of an object by specifying its version ID. You can permanently delete an object by specifying the version you want to delete. Only the owner of an Amazon S3 bucket can permanently delete a version. Daily Storage Metrics for Buckets ‐ You can monitor bucket storage using CloudWatch, which collects and processes storage data from S3 into readable, daily metrics. Request metrics ‐ You can choose to monitor S3 requests to quickly identify and act on operational issues. The metrics are available at 1 minute intervals after some latency to process. You can have a maximum of 1000 metrics configurations per bucket. 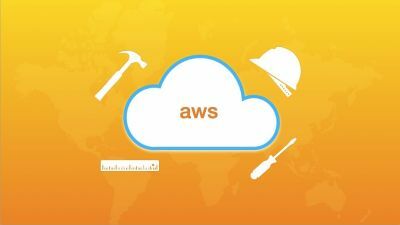 Supported event activities that occur in S3 are recorded in a CloudTrail event along with other AWS service events in Event history. Enable website hosting in your bucket Properties. Your static website is available via the region-specific website endpoint. You must make the objects that you want to serve publicly readable by writing a bucket policy that grants everyone s3:GetObject permission. Supports both public and private content. Supports only publicly readable content. Returns an XML-formatted error response. Supports both object-level and bucket-level redirects. Supports only GET and HEAD requests on objects. Returns a list of the object keys in the bucket. Returns the index document that is specified in the website configuration. Does not support SSL connections. To enable notifications, add a notification configuration identifying the events to be published, and the destinations where to send the event notifications. Enables automatic, asynchronous copying of objects across buckets in different AWS Regions. S3 must have permissions to replicate objects from the source bucket to the destination bucket on your behalf. If the owner of the source bucket doesn’t own the object in the bucket, the object owner must grant the bucket owner READ and READ_ACP permissions with the object ACL. Objects created after you add a replication configuration. 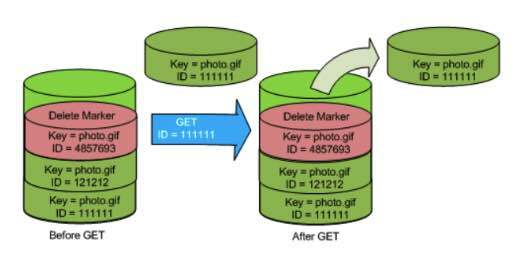 Both unencrypted objects and objects encrypted using Amazon S3 managed keys (SSE-S3) or AWS KMS managed keys (SSE-KMS), although you must explicitly enable the option to replicate objects encrypted using KMS keys. The replicated copy of the object is encrypted using the same type of server-side encryption that was used for the source object. Only objects in the source bucket for which the bucket owner has permissions to read objects and access control lists. Object ACL updates, unless you direct S3 to change the replica ownership when source and destination buckets aren’t owned by the same accounts. Objects that existed before you added the replication configuration to the bucket. Objects created with server-side encryption using AWS KMS–managed encryption (SSE-KMS) keys. Objects in the source bucket that the bucket owner doesn’t have permissions for. Objects in the source bucket that are replicas created by another cross-region replication. You can replicate objects from a source bucket to only one destination bucket. If you make a DELETE request without specifying an object version ID, S3 adds a delete marker. If you specify an object version ID to delete in a DELETE request, S3 deletes that object version in the source bucket, but it doesn’t replicate the deletion in the destination bucket. This protects data from malicious deletions.